Saif Ali Khan and Amrita Singh's gorgeous daughter Sara is working hard to make a lasting first impression with her debut film in Bollywood. She is the paparazzi's favourite star kid and is often spotted either outside the gym or yoga centre. We must say, she keeps her fitness game on point. 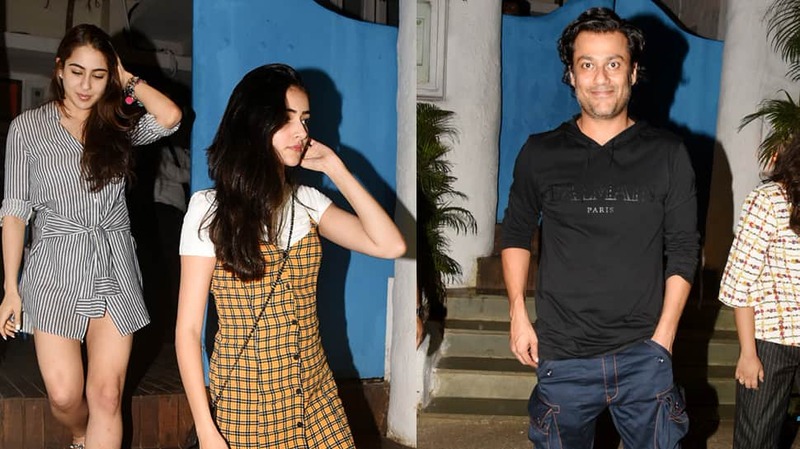 Sara was spotted at Olive and she was not alone but 'Student Of The Year 2' star Ananya Panday and 'Kedarnath' director Abhishek Kapoor also gave her company. Ananya will be seen in Karan Johar's 'SOTY 2' along with newbie Tara Sutaria and Tiger Shroff. Now, this trio was out on a dinner date and this is making us wonder whether a movie is in the pipeline? Well, it's too early to comment on that but even if it is the fans are surely going to love it. Sara can be seen smiling and waving at the shutterbugs who love to click her pictures. On the work front, Sara was earlier set to make her debut in 'Kedarnath' but due to some issues between the production house and the filmmaker Abhishek Kapoor, the film has now been delayed. It stars Sushant Singh Rajput in the lead. Although the differences have been sorted out, it looks unlikely that 'Kedarnath' will be her maiden release this year. But even before her maiden movie, she bagged yet another big project in her kitty. She will be seen opposite Ranveer Singh in 'Simmba'. The film will be helmed by Rohit Shetty and co-produced by Karan Johar. The film is slated to hit the screens on December 28, 2018.